I was browsing on ebay and came accross an item I'd really like for my collection. However the seller marks in big red capitals that the buyer is responsible for import duties. I know normally this is the case, and I've bought expensive items from ebay before. But since it's written there like that it worries me and makes me reluctant to buy the item. I searched the rules for my country and it says I have to pay 19% on top of the written value + shipping. And I've sent the seller a message to ask if they will mark it as a gift or below value. 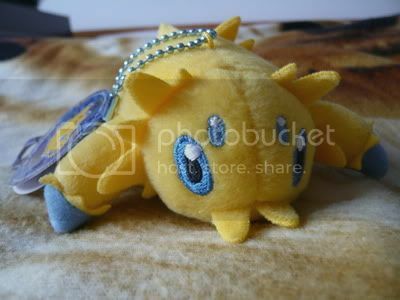 Hope this is not off topic, the item I want to purchase is ofcourse pokemonrelated. Also on the lookout for a Flareon & Vaporen charm! What are they going for these days? I was hoping to pay around $7 or $8 each but if that's being too optimistic you can put me right on that score! Wants, Get Storytime... and a question! 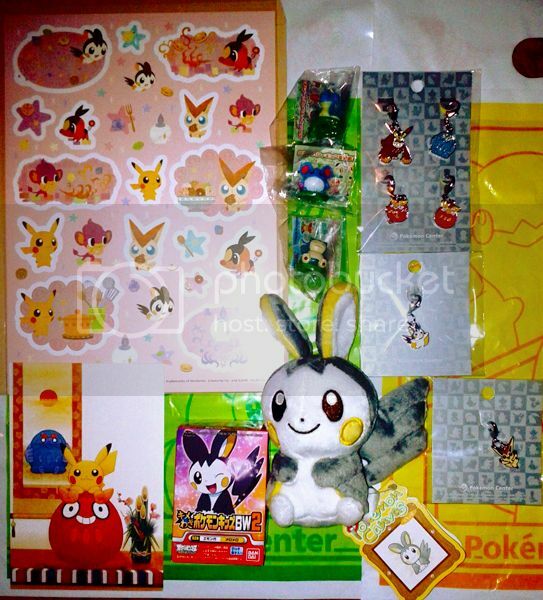 Okay, I know everyone's going all charm-crazy right now [and with my Wave 3 charms on their way, I can understand why! They are cute... so I'm all aboard the Charm Train - my current list of charm wants are HERE and other wants [plush, etc] are HERE], but I have a question that I'm sure has been asked many times over that's somewhat related to the story of... one of my latest gets! 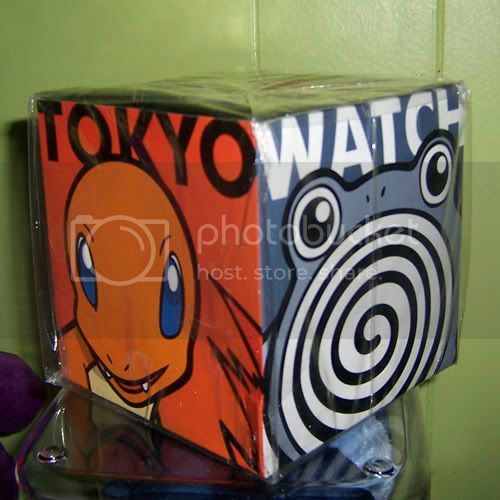 Fellow Pokemon collectors: Have you ever found/bought something [a get, a grail, just something amazing that's obviously Pokemon-centric] anywhere that you walked away from, only to find it waiting for you at a later time? You know, almost as if it was meant for you to buy it? Tell me about it - I'm curious to know if this sort of happening is rare or if it's rather common amongst other collectors! I can't wait to hear your responses! I'll comment in the morning... but now, time to sleep...! Thanks for reading! Glittering Hoard GA Payment 2 and extras! Okay, I know this comm is anti life-drama, but my week has been so unexpectedly weird and busy that I was unable to give this quote on Monday as originally expected! I've been to York to learn about ordination, travelled on the train to collect rare imported fish, and now I'm finally at down to type these totals up. Paid parcels will ship Monday through Wednesday, and then whatever day payment is received. I'm enlisting the help of my super organised mother to get this done, due to the size of the GA.
- Prices do not include the any changes to shipping because some of the changes depend on your original package weight. - Most parcels under 120g will not change the shipping price for a few small bits. - Haggling over extras is okay. I am already not charging for packaging, so try and be fair. - Be reasonable in the amount you claim. - Participants (paid) only until everyone's had a look. Then the comm can claim bits. All charms have been claimed! Thanks guys! Sales and an Espeontastic update! Hi everyone! I have been super busy this past week, but I'm back :D Some awesome things came! I lowered the price for the kaiydo lot to $35 shipped anywhere. Click on the picture for more info. Everything paid for was shipped out last Wednesday :D And I added a bunch of new stuff to the flats and miscellaneous section including charms!!! Oh and I've got some offers! A corphish TFG and some pokemon cloth that came out around the Jircahi movie! Click on the pictures to get there! As you all know, there are figures considered 'bottlecap' figures, and have been seen in various places. Most of ours in the States have been found in Trading Card packages, like the Mewtwo collection or the card tins. However, I bring a question about them. 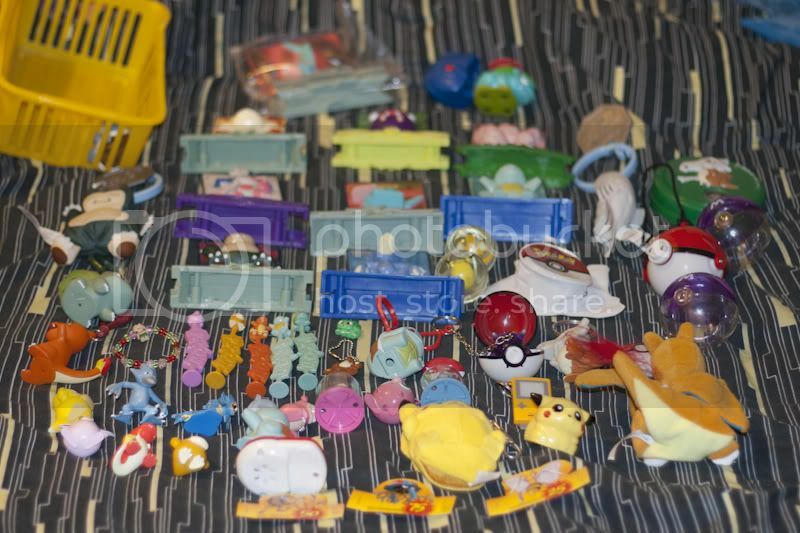 How many bottlecap figures actually exist, and what Pokemon were made? 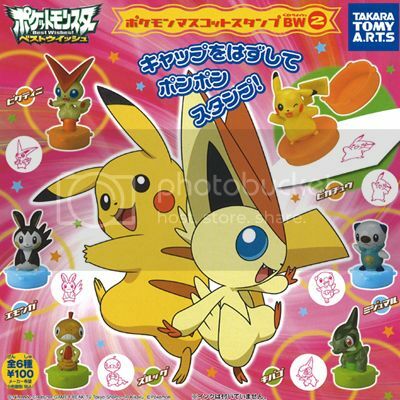 I'm looking into collecting them, and want to see what Pokemon are available, how many bottlecap figures actually exist, and how much each might go for. I'm fully aware of these Pokemon being available as bottlecap figures however: the Unova starters and their final evolutions, Entei, Zekrom, Reshiram, Victini and Mewtwo. I'm not sure what's up with me this generation... I'm way too used to collecting Pokemon who didn't get much merch, so collecting 2 anime stars and now a movie star is a huge change of pace. XD I did collect a movie star before though, and I've missed trying to get all the numerous goods, so I'm not complaining! Does anyone else plan to collect a Pokemon from the next movie? If you happened to buy something from me from my latest sales post, it was sent Tuesday! I am very sorry for the slight delay!! I keep seeing these stampers on eBay, but they don't look like Tomy quality to me. So I am wondering if they are legit? The ad looks good, but some of the figures don't. I think the paint job on this Scraggy looks pretty bad, so this is the main reason I ask. Oh and speaking of STAMPS... Super Sparkly Stamp GB needs a few more claims. If none other stamps are claimed I'm going to go ahead and buy up the remaining ones so everyone who is currently participating can still get their stamps! Today I have just a brief question for you all! Is there an easy way to list tcg that you have available for sale/trade? Maybe like a website that other users could see that's like a checklist. I seriously have stacks. And stacks. And stacks of doubles/triples/thousands. Going through and picturing them all, keeping theme in set/number order, or just keeping a sales post organized is just a lot of time that I don't have at the moment!! Especially for 5000 cards <didnt really count, just assuming) So yes, any pointers to selling tons of cards and keeping it neat would be wonderful! The reason I ask is because I would rather offer them to the com before I do sets in bulk. I keep overwhelming myself just trying to keep it all sorted! Thanks so much my lovelies! Expect a final collection update soon/new set up to my move while I am still on a hiatus. I hope everyone is doing well! Today I want to share my entire plush collection. I have started collecting around september, and ever since then my collection has grown exponentially. Just to warn you there are many images in this post. My first gets from pkmncollectors! Could you guys leave some pics of your Milotic/Feebas merch? I know theres not a lot, but I wanna get a good idea for how much there is. Closeups and things under the cut! Hey guys! Don't forget, my auction on my lovely MWT Jolteon Canvas still going on! It ends in about 48 hours, and the poor guy has no bids yet! Don't you want to give this deserving Canvas a new home? 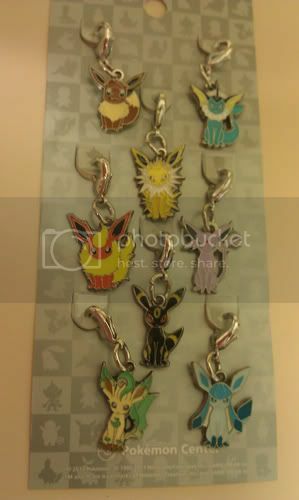 After some contemplating I have decided to try to GB a set of eeveelutions charms! I know, shoot me, you are probably thinking, oh not another one, but maybe there are some folks out there that just like me decided they DID want more than just 1 or 2 charms and are seeing this as their only option ;) This is the cheapest way possible to get them I think. NEW GETS & WTB Karrablast MPC! Trying to get rid of the rest of the stuff I'm selling. Giving you guys a chance to look before I take it to a swap meet. MPC Set 12 GA: Final Payments! Check the Spreadsheet for your totals!! Please send your final payments to glowingferret@gmail.com! Thanks everyone for participating and helping me get my precious heatmor MPC. :) I love him so much! 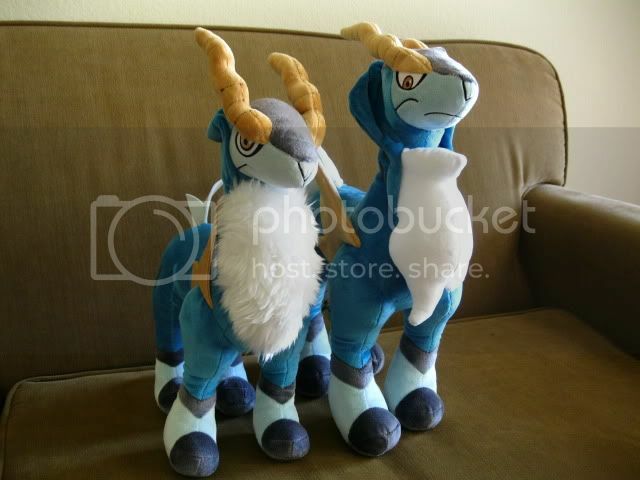 So ever since I joined the community, one plush has always been high on my wants list! And it's finally happened!!! My baby is in my hands now!!! And it's all thanks to cyritic <3333 Thankyou so so so much!!! Aaaahhhh I really am truly happy to have the fluffy little guy in my arms! Look at his adorable wittle face!! And seeing as I'm here I thought I'd do a bit of an update on how my collection is coming along! Hey guys, just a reminder of the Virizion Kids GB that I am doing. There are a lot of pokemon that still have little or no claims yet, so do claim them so we can get more zweillouses and mienshaos XD such as Unzefant and Conkeldurr and Pikachu! 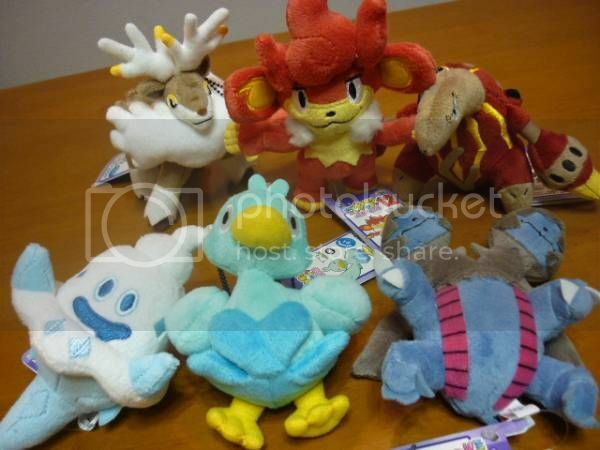 Click the Picture or this linkhttp://pkmncollectors.livejournal.com/11618904.html to get to the original post.